Supposedly this is Richard Nixon's recipe, simplified from a Capitol Hill Cooks. Politics aside, I do love a good grapefruit as well as the idea of broiling or grilling fruit. One of the benefits of broiling the grapefruit is that you get a lot more flesh and juice than you would eating a cold one. 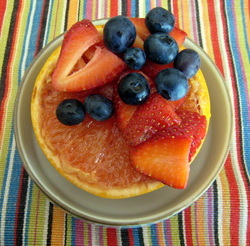 This makes a nice light dessert--just go easy on the honey and sugar because heating the fruit will automatically mellow some of the grapefruit's 'bite'. Cut the top quarter off the grapefruit and then use the grapefruit knife to separate the sections. Drizzle with a bit of honey (or agave) and sprinkle with brown sugar. Broil on high until the grapefruit top gets bubbly and starts to separate from the rind, about 5-6 minutes. It is very quick. Add berries and serve warm.